Whatever you do, don't call Russell Westbrook old. 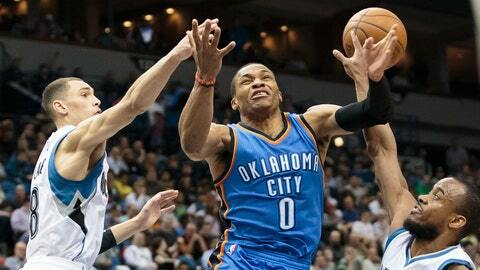 The media just can’t win when dealing with Oklahoma City Thunder guard Russell Westbrook. No matter what they say or do, it’s going to annoy the Thunder’s surly superstar. The latest example: After torching 19-year-old Minnesota Timberwolves rookie Tyus Jones on Wednesday night, Westbrook was asked what it was like for him to face older veterans when he was a 20-year-old rookie. When asked the question in a different manner — this time emphasizing experience rather than age — Westbrook had a more diplomatic response. Westbrook had to face guys like Steve Nash and Derek Fisher as a rookie — they may have been more skilled and poised, but they weren’t physically superior. Westbrook was better than Jones in just about every facet of basketball on Wednesday, and one can only hope the rookie takes the lesson as motivation. One can also hope the media learns its lesson when speaking with Westbrook.